The best part about having a gazillion food sensitivities is that if forces you to play with your food. When almost every recipe you encounter contains at least one ingredient that you can’t eat, recipes become jumping off points rather than road maps. With a blizzard raging outside all day, this was the perfect day for experimenting. Breakfast was quinoa pancakes with dried cherries, egg, chia, cinnamon, raw cacao nibs and walnuts. Admittedly, this was more of a kitchen sink approach to getting some healthy foods in at the start of the day than a culinary delicacy. My husband let me eat it all myself (in other words, it was too health for his taste!) 🙂 No worries. There are advantages to not having to share and I had fun cooking it. For lunch I created a new garbanzo bean veggie burger recipe inspired from one my niece posted the other day. They came out really awesome but we gobbled them down without taking a photo. I made them from garbanzo beans, grated raw sweet potato, cooked quinoa, egg, garlic powder, onion powder & oregano topped put gently through the food processor and served topped with caramelized onion, fresh tomato & vegenaise on a toasted millet bread roll. Next time I make them I’ll have to take a photo & share the recipe! Dinner was chicken soup that simmered slowly all day. The best part was the fresh shitake mushrooms that I harvested from the indoor mushroom growing kit. Yum! Yum! I finished up the day making banana bread with the browning bananas that were begging to be used. As usual, I started with my mother’s banana bread recipe as a rough guide and then I tweak it as the mood strikes me – the hardest part is figuring out how to make it without shortening and sugar. For this evening’s version I substituted peanut butter for the shortening & oat flour for the wheat flour. I put in 3 bananas and no added sugar and tossed in some raw cacao nibs. The batter tasted fabulous – a flavor that hinted at Reese’s cup with the combination of peanut butter & chocolate. I have high hopes for the bread. Oops, there’s the buzzer now. Gotta run! 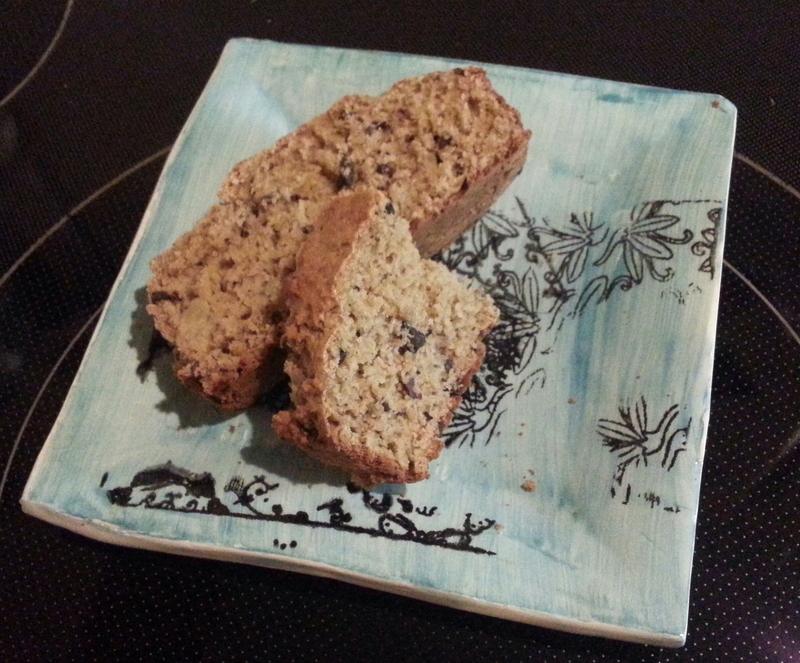 My original peanut butter banana bread served on a screen printed plate I made in clay class. Cooking and art are two ways I enjoy expressing my creativity. So forget what your Mom said. Dig in, use your creativity and have fun playing with your food! Posted in response to this week’s photo challenge – Express Yourself.